Regular readers may recall a March 2007 posting on a delightful Mandolin concert we attended in Split, direct link - Croatia Online - Music With A Difference. There's another one coming up tomorrow, 20th March 2008, this time with a French theme. Full details as below and the added bonus is it's free! 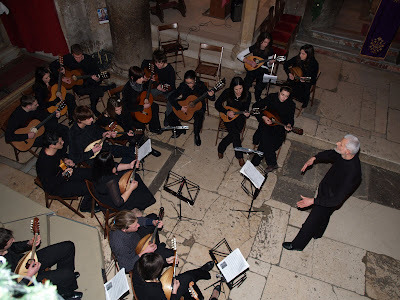 On the occasion of the International Francophony Day, 20 March, The Alliance Française de Split and the City Mandolin Orchestra Sanctus Domnio organise a concert of music composed by French composers, composed genuinely or arranged for mandolin orchestras. The concert takes place on Thursday, 20 March 2008, at 19:00 hrs., in the Split Puppet Theatre, Tončićeva 1, Split. The entrance is free and all mandolin fans are welcome.